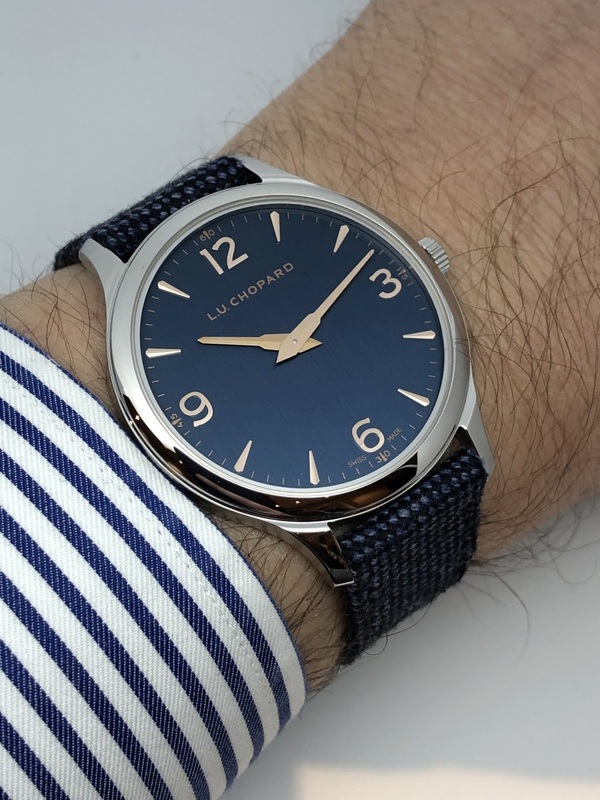 The novelties unveiled by Chopard at the 2019 edition of Baselworld mainly focus on the LUC collection and explore different types of blue dials. Through this collection, Chopard remains faithful to its line of conduct by offering classic, refined watches that all have a touch of originality. Chopard also took the opportunity to present, as tradition, the Mille Miglia Race Edition of the year. I propose you to discover these watches. The LUC XP Navy Blue is a very nice surprise. Simple (it is a two hand watch! ), with a nice blue dial (featuring an original vertical satin brushed texture), it is nonetheless subtle. I really appreciate the font of the numerals and the indexes. The typical hands of the LUC collection find in this context a refined context that enhances them. The 40mm diameter is perfect for me, the perceived size being slightly lower. This watch brings two very good news: first it has no date which reinforces the dressed style and then its case material is stainless steel. And how not to evoke the merino wool strap that almost makes it think about a watch dedicated to Savile Row? 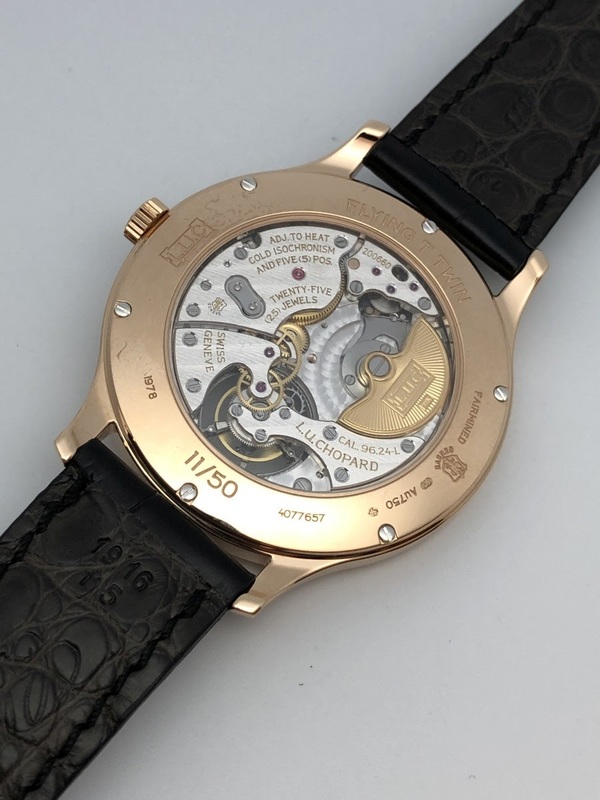 Finally, it is animated by the automatic micro-rotor movement LUC 96.53-L , whose thinness is adapted to the context. Its 58-hour power reserve is a plus for this type of watch. The LUC XPS Twist QF is also a nice surprise. Admittedly, this watch has a date window but its presence is not shocking, balancing the dial because of the off-centered second hand. And then, it makes a difference compared to the previous XPS Twist "Fairmined". The advantage of this watch is the finish of the blue gray dial whose sunrays starting point is located on the subdial. This nicely accentuates the asymmetry and gives character to the watch. The absence of numerals gives a very contemporary style. The "Fairmined" 40mm white gold case seemed paradoxically a bit too big here because of the date window position. The watch is animated by the caliber LUC 96-26-L which is excellently finished and which offers a 65-hour power reserve. The LUC XPS Twist QF is available in a limited edition of 250 pieces. 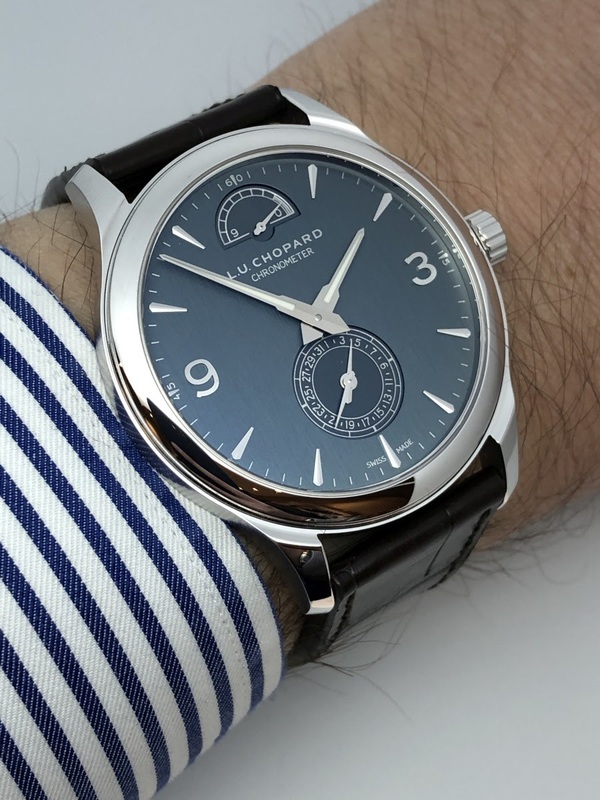 We remain in the world of blue dials with the LUC Quattro which offers an appealing vertical satin gray blue dial and a white gold case with a diameter of 43mm. 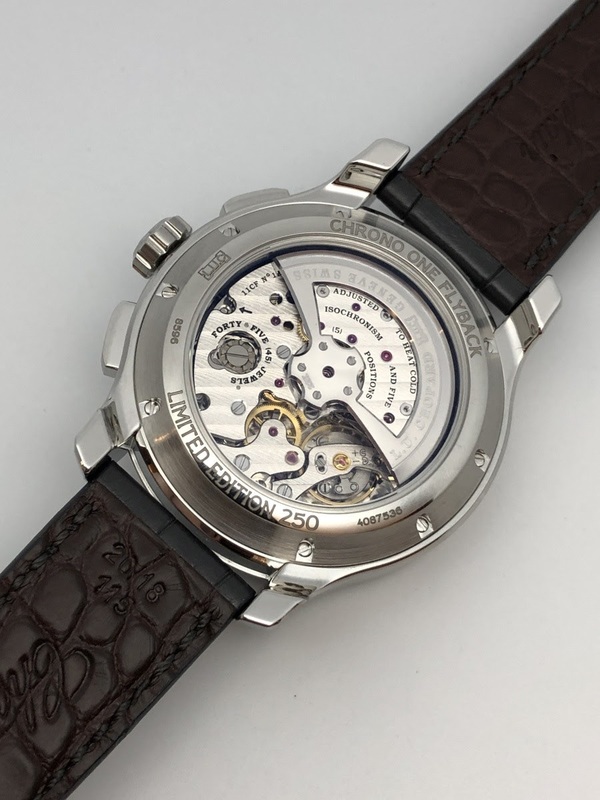 The presentation of the complications remains identical to the previous models with the display of the power reserve at the top of the dial and the date, by hand, at its base. I would also like to see one day a Quattro available without the day date or replaced by another complication (moon phases for example). In any case, this piece manages to release a certain elegance despite its imposing size. 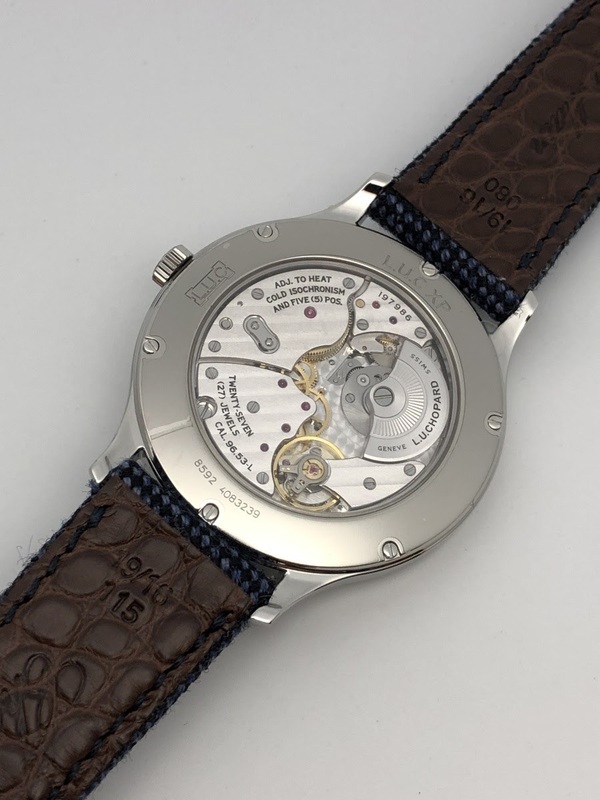 Its movement is, of course, the manual winding caliber LUC 96.01-L which offers a 9-day power reserve thanks to its four barrels. The watch is offered in a limited edition of 50 pieces. 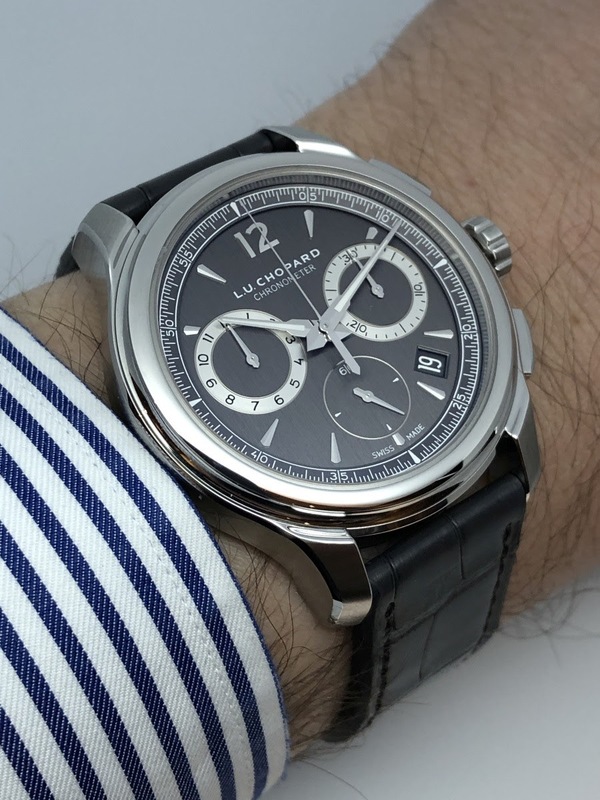 The LUC Chrono One Flyback doesn't have a blue dial, but its gray dial looks great. 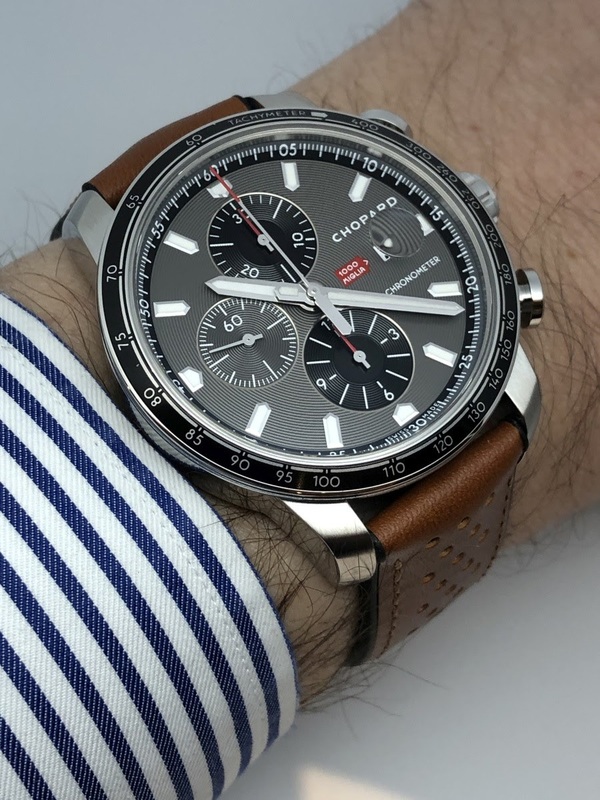 This chronograph is distinguished by several advantages: its steel case, its more contained diameter, the removal of the crown guard, the more refined design. And I find again with pleasure the dial lay-out of the Chrono One which positions the permanent second hand at 6 o'clock which makes the reading of the chronograph data simple and pleasant. The watch is animated by the movement LUC 03.03-L whose contemporary presentation fits well with its atmosphere. I really like the way the column wheel is highlighted. Finally, the power reserve is 60 hours. The LUC Chrono One Flyback is offered through a limited edition of 250 pieces. The highlight of the show is the LUC Flying T Twin. Indeed, this is the first time that Chopard presents a flying tourbillon and the manufacture haven't done things half in this case. 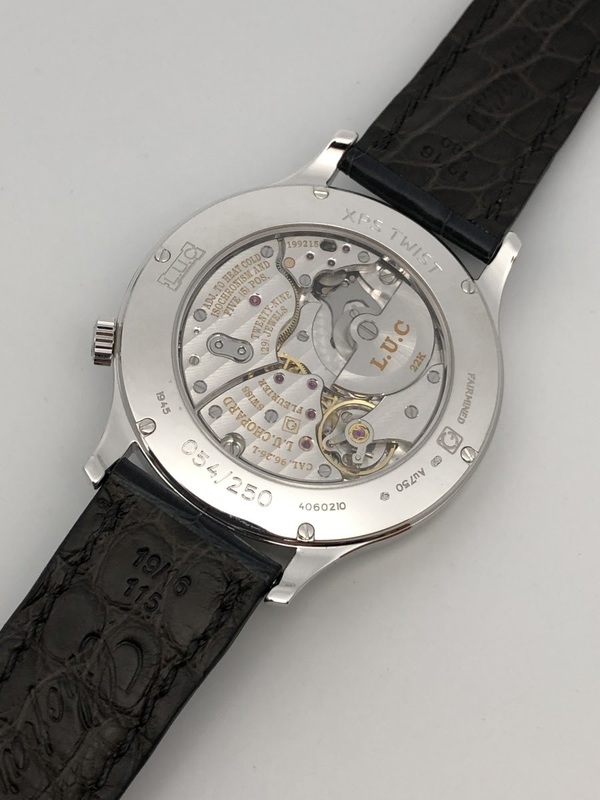 First, the movement LUC 96.24-L is also automatic and is distinguished by a (quite rare) frequency of 3.5hz. 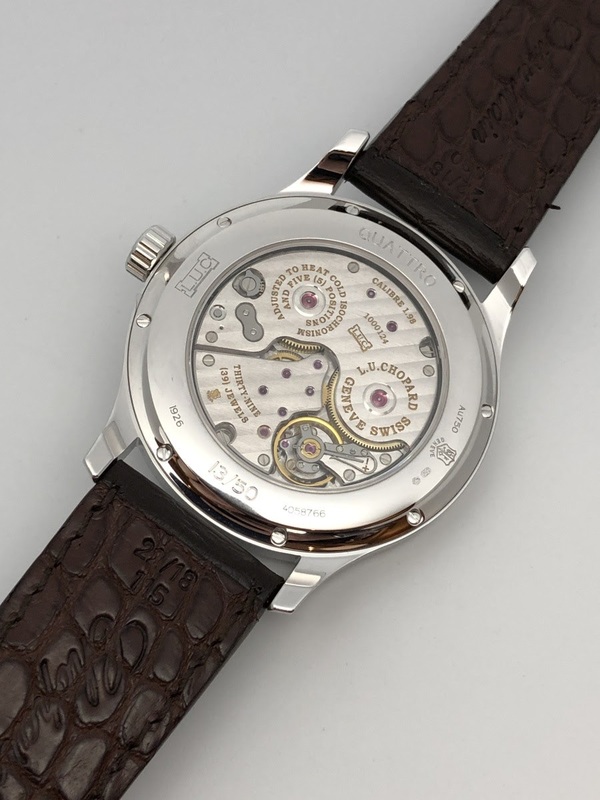 It is then very fine (3.3mm) and reaches 65 hours of power reserve thanks to its two barrels. The behavior of the the tourbillon is very pleasant to observe even if I would have liked a larger opening. Or, I would have reduced the 40mm case. The finish of the dial is excellent and I particularly appreciate the central honeycomb pattern. Taking into account the thinness of the movement, the case height is only 7.2mm which gives to the LUC Flying T Twin a very slender style. It is very beautiful watch, available in limited edition of 50 pieces, and which proudly bears the Geneva Seal. If I was seduced by the Chopard offer around its LUC collection, I was less excited about the novelties from the Mille Miglia collection. In fact the problem is that the two Race Edition pieces (stainless steel and two-tone) is a bit of a summary of some trends I don't like. 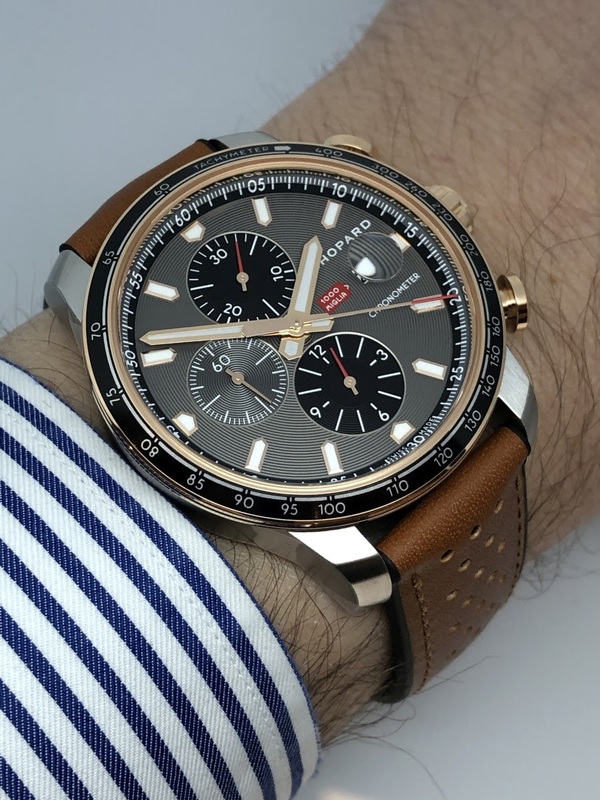 The watches are (too) imposing (44mm mushroom pushers), lack refinement despite the quality of finishes and move away, in my opinion, from the spirit of the first Race Edition watches. 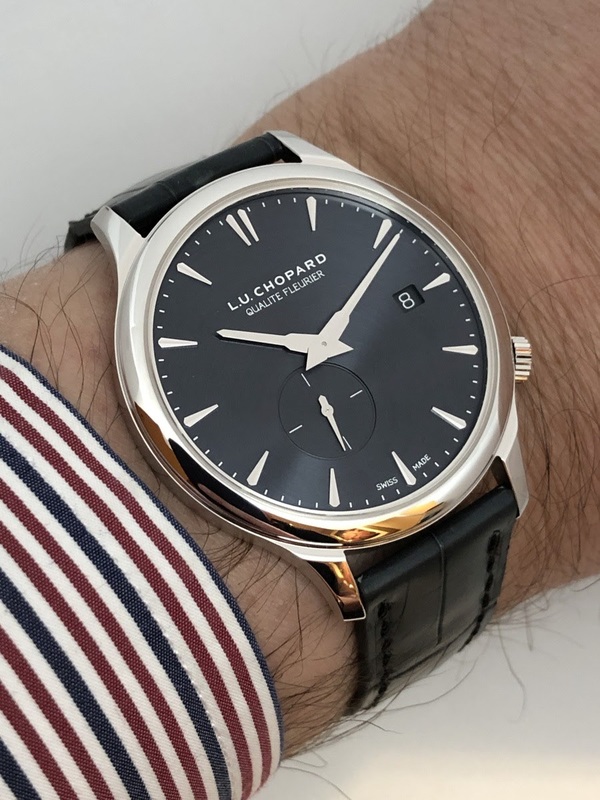 I think Chopard should come back to more simplicity with smaller watches and with some distinctive details (no date for example: the watches of the permanent collection have it so it would not be a problem). I think that Chopard should redesign its approach on this field in my opinion. 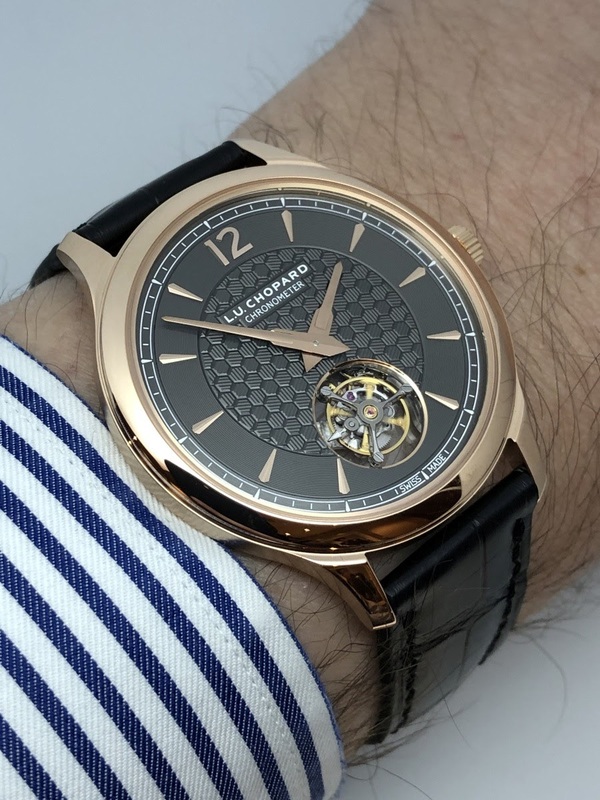 Despite this damper, I found the 2019 collection of Chopard appealing with LUC novelties well made and well thought out, all in an elegant style and without ostentation. It is for me a good year for the manufacture. The first one, without date and with the micro rotor, is very nice looking. Yes, really nice. Thanks for the review, Fx. Thanks for your great review and pics! Love the LUC XP. Especially with the blue dial and steel case. Thanks for the comprehensive review, Forevsta! Nice to see that the LUC Chrono One has been fine tuned. Is the case still 42mm? It at any rate looks like the new lugs will make it wear even better than the originals. Did you have a chance to try it in the titanium case, too? Any pictures? I quite like the QF. And this merino strap is an excellent idea!